Reservations Are Recommended to Secure a Spot on the Tour. Please call 1-808-329-6840 to confirm tour times, ticket prices, and reservations. Tour Tickets can be purchased at the farm gate the day of the tour or online at least 24 hours before the tour. Tour times change according to seasons and often sell out, so please make reservations or purchase your tickets on-line well ahead of time. We are closed on Weekends and Christmas Day. Seahorse Gift Shop is open during tour times. 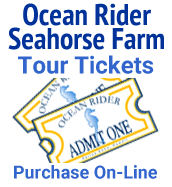 Contribution from your purchase of tour tickets and gift shop items stay here, on the Ocean Rider seahorse farm where the funds are used to save the seahorses from extinction through the continued research, education, conservation and propagation of the endangered seahorses and sea dragons! 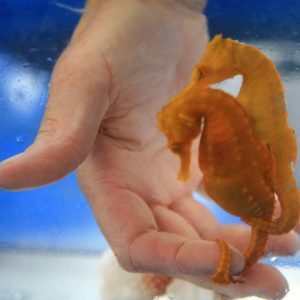 Toddlers are too young to hold a seahorse but can enjoy the tide pool and fish feeding area. Prices are subject to change without notice. We cannot guarantee you a spot on the tour without reservations. You may purchase your ticket on line or at the farm gate. Sorry, no refunds!! 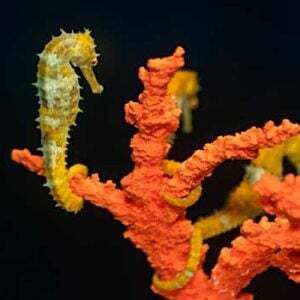 Important Contamination Message: We encourage you to visit our Seahorse Farm first.!!! Our guests cannot visit our facility within 24 hours from visiting another (outside) farm due to contamination. Please feel free to bring your camera with the flash off!! Sorry no video!. Please wear comfortable shoes and a hat! Tour tickets are not shipped but available for pick up only. Due to strict bio security rules, you must be on a tour with a tour guide at designated tour times ONLY! Please arrive 15 minutes to purchase your ticket, wash up and read the bio security tour rules!